San Yuan Yu Iron Works Co., Ltd.
Jan 08, 2016 | By CENS | SAN YUAN YU IRON WORKS CO., LTD.
San Yuan Yu Iron Works Co., Ltd., founded in 1960 in Kaohsiung of southern Taiwan, makes forged steel products, including crankshafts, rollers, gear blanks, flanges, rolled rings, and various mechanical parts, with output capacity of up to 700 metric tons a month. The company, being certified to ISO 9001 and DNV standards for quality, counts among its primary customers China Steel Corp. (CSC), Formosa Plastics Corp., CPC Corp., and CTCI Corp., which are all well-known industrial firms with considerable history and market shares on the island. Having built a steady stream of orders from these Taiwanese heavyweights, the company has begun a program to explore overseas markets. To assure customers of top quality, the company chooses high-grade carbon steel, stainless steel and steel alloys from Europe, Japan, South Korea, Brazil and mainland China. 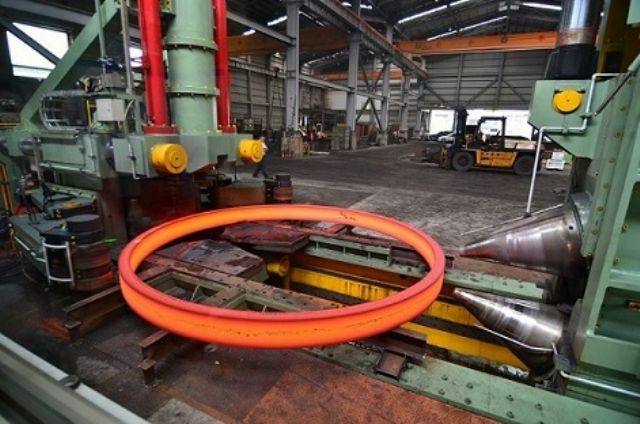 The Taiwanese manufacturer operates two forging factories, which are equipped with a 2,500-ton forging press, a 4-meter ring rolling machine, and heat-treatment machines measuring 5-meter long, 5-meter wide and 1.4-meter high, among others. The manufacturer has set up solid technical strength, upheld by precision manufacturing equipment, stringent quality inspection, systematic management, and well trained R&D specialists. San Yuan Yu's forged products are of high-end carbon steel, stainless steel, and steel alloys.